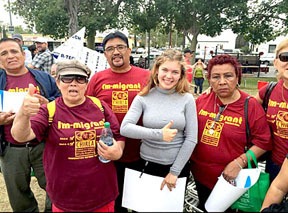 COALITION for Humane Immigrant Rights stand with Lily Larsen to raise awareness for immigration reform. My interest in activism started early—I was only five when I attended the “Day Without Immigrants” march in 2006—but I was interested in what it means to other students my age. So I sat down with Heavlynne Richard, 14, and Jordan Cain, 15, to interview them on the topic. I started by asking them what social issues currently have their attention. “Definitely racism, feminism and LGBT issues,” says Jordan, who is a student at Los Angeles County High School for the Arts. Heavlynne says her brothers have complained about racial profiling while they’re out with friends, and her father too: “Why do police pull over my dad—a security guard—when he did nothing wrong?” she complains. I next asked them if they felt people take their activism seriously, being only 14 and 15 years old. Heavlynne says she recently attended West Adams Neighborhood Council’s “Storied Streets” screening and discussion on homelessness and was surprised by what she found. The three of us chat for more than 40 minutes, and I leave feeling encouraged. For me, activism is important because it helps people recognize what is going on in the world, and makes many topics public. This is our planet, and in order to make it a better place we need to get our hands dirty, whatever that means to you. Because that’s what activism means to me: to be a part of the change you look for, not just the change you hope for. Let’s keep making this world a better place. Larsen, 15, is a student at Los Angeles County High School for the Arts, and is a self-proclaimed adolescent activist. Raised alongside her family business (an arts non-profit for youth), Lily serves on the Mayor’s Youth Advisory Council, helping to spread awareness for worthy causes. Her petition to end factory animal farming has garnered more than 15,000 signatures. You can follow Lily at adolescentactivist.com.